Welcome to Shamrock's Buzzy Bee. 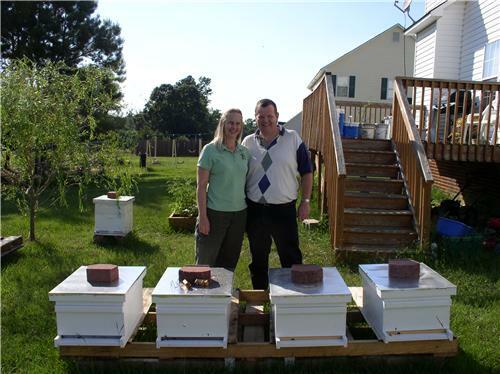 We are beekeepers located in Four Oaks NC. The honey is produced by our bees in Four Oaks and throughout Johnston County. The honey comes from nectar the honey bees collect from wildflowers, trees, weeds, and more in the area. For this reason, we sell only Wildflower honey. Our honey is raw and comes straight from the hives to you. It is not processed, treated, heated, filtered, or altered in anyway. We offer liquid honey, cremed honey (in pure honey and flavored) and comb honey (in season). Additionally, we use beeswax to make beeswax bars, candles, lip balm, and skin cream. We use honey in soaps and our gourmet dog treats. Lastly, we have a variety of honey straws and honey candy. Cremed Honey: Cremed honey is crystallized honey that takes 7 to 10 days to make. When the crystallization process is tightly controlled, the honey crystals are so small that the resulting product is a spreadable, smooth textured. Our cremed honey is made from clover honey and we have several flavors to choose. Cremed honey can be used on toast, ice cream, bagels, crackers, in tea, plus more. We sell our honey products throughout Johnston County. Please click on the “Find US” tab. We also can be found on Facebook for more up to date locations.